Fables are back, implemented with all your Omega needs and playable at the Vintage Gacha Fair with a small, heritage, gift. Fables was the first Fallen Gods Inc. Tattoo/Skins Gacha released at an event, back in 2015 at Fantasy Gacha Carnival. Mesh bodies were only a novelty as well as Gacha events and the research for a universal system like Omega just started to get implemented while SLink had the monopoly, so the gacha itself featured an insecure effort to feature what at the time was thought sensible: tattoo system layers for the common sets, and some SLink appliers for the rare skin packs. The Gacha itself was the first introduction of the Generation 4 of Fallen Skins and a personal return to genetics after a hiatus that was caused mostly by the huge changes in avatar skin-making: it was a labour of love and detail and am very happy to bring it back. Now 3 years later things changed: my effort to make the whole store Applier friendly is almost complete, just a few Omega demos missing and a few Gachas to update with face tattoos. Those updates were quite a delicate matter mostly because I wanted to give customers ways to simply get their old selves back visually without hurting too much their pockets and trust, so it was a research for balance between helping you update yourself and making me survive. Afterall you can get your old car for a new one with a discount, but rarely for free as there's always work involved. There are projects that I can update while helping older customers to hunt for a beloved tattoo, or feature it on discount sale events, there's other I provide separate appliers and a few that were impossible and simply redone. 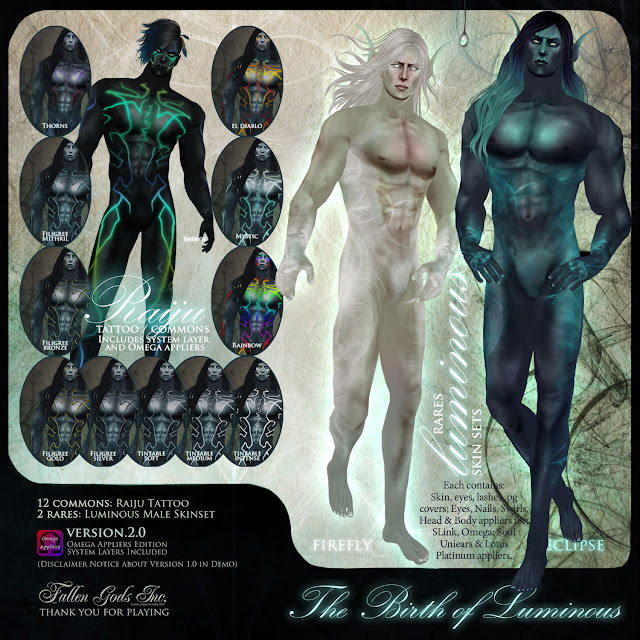 Some Gachas as Necromantica had the face Appliers sold separately as copy items to help previous Patrons and some face tattoos were often proposed as gifts for a period of time and special events. Fable is not one of those projects though where an update is possible, so instead of adding another button to the Gacha that says Omega I am simply calling this version 2.0 the Omega edition with system layers included. The Gacha will be moved and available at the Store after the event.